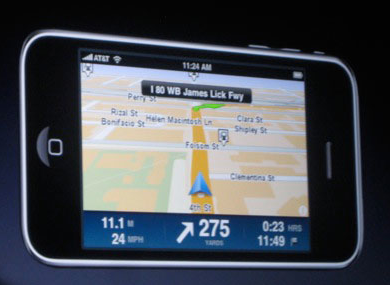 Looks like the iPhone 3.0 firmware plus the new 3Gs hardware will give the dedicated GPS market a run for it’s money. The new hardware includes a magnetometer, otherwise known as a digital compass. Combine that with the A-GPS, which supplements the slow satellite signal with fast WiFi and cell phone tower triangulation, and accurate and timely turn-by-turn navigation is possible. Both TomTom, Navigon, , and TeleNav have jumped into the fray, joining X-Roads which was briefly available in a crippled form on the App store. Garmin might be shooting itself in the foot by staying out, but they have their own GPS + phone plans already. Besides the added precision of the new hardware, it’ll be easier for developers to incorporate maps directly into their apps. We should see a whole new class of apps available. Imagine walking along a street and pointing your phone at a building, statue, mountain, road, etc and have reams of helpful information come up about that particular feature. 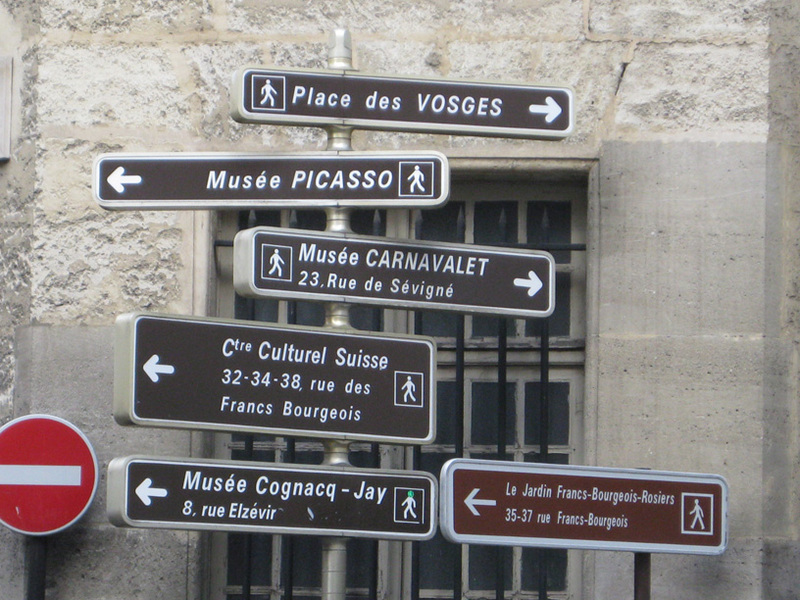 A great wayfinding device in the making! See related post: Wayfinding: Here, Even Icons Need IDs . . .
[Editor’s note: Maps are most useful when held in the hand and referenced while in a landscape. But sometimes it is hard to match the abstract map topology with what is literally just in front of us. Or maybe the map was left at home. Maps are best when combined with confirmatory signage (direct annotation) in the landscape itself. These signs should have prominent, frequent placement and be easy to read. Signage that is small and/or discrete is pointless. Also see John Kelly’s blog post on signage in the Metro rail subways. The two Belgian tourists paused on the pathway near the Washington Monument to answer a question. Could they identify the towering white obelisk before them? It was understandable. They had never been to Washington before. There was no sign nearby identifying the monument. And so the two tourists found themselves in the midst of a fresh debate: Do icons like the Washington Monument and Lincoln Memorial need signs announcing what they are? The National Park Service, which is about to install an extensive new system of signs on the Mall, says yes. Many foreign and American tourists have no clue what they’re looking at or what to expect when they arrive, the Park Service says. Officials say, for example, that they often get calls from the public asking if there is a Nordstrom on the Mall. The debate arises as the Mall is about to get a new $2.2 million sign system, funded by the federal government and the private Trust for the National Mall. Design research is underway, with a view to replacing the mishmash of signs on the Mall with a more uniform and user-friendly system that will probably use a series of color-coded pylons. Across the Mall, there are signs with directions, signs with warnings, signs with rules. 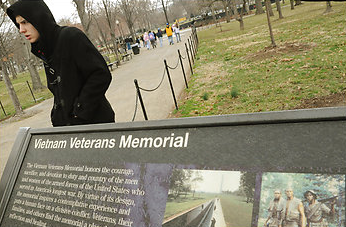 “Please Stay on the Sidewalks,” reads one at the Vietnam Veterans Memorial. “Quiet” is called for at the Lincoln Memorial. “No Guns or Ammunition,” says one near the Washington Monument. Attention iPhone software developers! 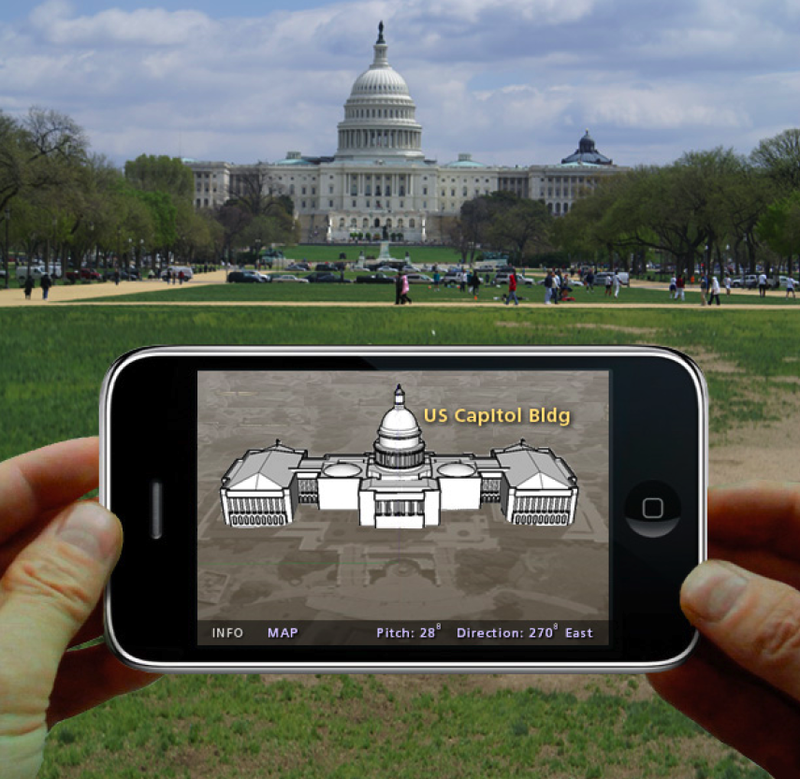 The National Park Service is soliciting proposals to create a National Mall mobile wayfinding protoype, otherwise known as an iPhone app! It is a rather ambitious, forward-looking project that will depend on the contractor to propose technological and design solutions. The product would serve as a template for creating similar products of other urban park sites. The request originates out of the Harpers Ferry, WV office of the Park Service. Check out the full solicitation with contact information. Independently, and not as an agent of the government, the contractor shall provide all labor, equipment, materials and services necessary to conceptualize, design, produce, test, and install a fully functional mobile wayfinding prototype of the National Mall in accordance with the attached Scope of Work consisting of 15 pages. The NPS recognizes that creating a mobile map prototype is a new, complex, and highly specialized undertaking that requires expertise in numerous disciplines, including cartography, database development, interface design, interactive programming, 3-D modeling, wireless networking, mobile phone application development, etc. The mobile map prototype envisioned for the National Mall is perhaps the first of its kind. The National Mall is the heart of the Nation’s Capital and of the entire United States of America. Here, the nation celebrates, honors, and demonstrates its commitment to democracy. The Mall stretches 2.2 miles from the grounds of the United States (U.S.) Capitol west to the Potomac River, and from the Tidal Basin north to Constitution Avenue. It is home to the great symbols of our country—national icons such as the Washington Monument, the Lincoln Memorial, and the Thomas Jefferson Memorial. It also includes memorials to the veterans of Vietnam, the Korean War, and World War II, as well as lesser-known memorials to American heroes, such as the 56 signers of the Declaration of Independence, George Mason, and John Paul Jones. The National Mall also boasts beautiful open spaces such as the Tidal Basin, where the blossoming of thousands of cherry trees heralds spring. Over 25 million people visit the Mall each year with 60% arriving by public transport and traversing the park on foot. Site navigation by pedestrians in urban national parks in general is a long-standing problem. For example, at the National Mall, visitors emerging from a Washington Metro subway station into bright sunlight first must orient themselves before setting off to their destination. Finding lesser-known sites scattered throughout the Mall, such as the John Ericsson Memorial, is a challenge despite the availability of paper maps, wayside exhibits, signs, and other traditional media. The growing popularity of smart mobile devices – devices with GPS, Internet connectivity, touch-screen interfaces, and powerful graphics capabilities – promises a solution to this problem. Applications are due by 02/12/2009. Looks like the Park Service would like to roll out a final app (free in the iTunes story? they don’t say) by next year in January (2010). Fixed Price contact to the software developer. Get coding!